3. 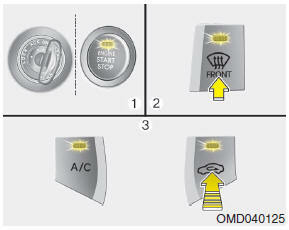 While holding the air conditioning (A/C) button, press the air intake control button at least 5 times within 3 seconds. The A/C display blinks 3 times with 0.5 seconds of interval. It indicates that the defogging logic is canceled or returned to the programmed status.